Mobile advertising is a double-edged sword. Developers need to make money. Many end users outright refuse to purchase apps. This is why mobile advertising exists. When it comes to me, I buy as many apps that I feel are worthwhile or innovative as I can. Devs need to eat so they don’t starve to death. If they starve to death we get no new things. While there are others with my mindset many are against buying apps, or simply cannot afford them. No matter which camp you belong to I’m sure we can all agree anything is better than the awful freemium model. All of that aside, if you are a developer and you decide to offer a free app with mobile advertising, there are two ways to do it. The right way and the wrong way. I mostly only download free apps when there is no paid version available. When done correctly the ads don’t bother me. I understand the need to monetize content. It’s when they’re done poorly that the experience suffers or someone might get outright offended. Would ya look at that? I mean just look at it. The image depicts an elderly woman who possibly just got a bingo. She seems pretty happy about something. 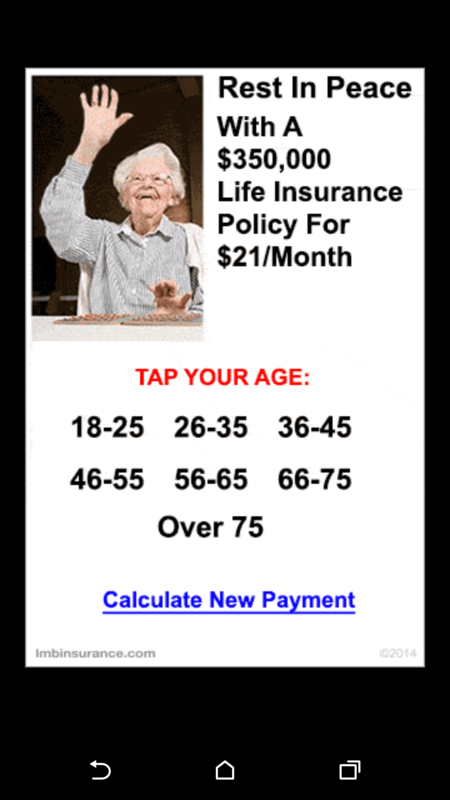 I’m willing to bet she’s not that elated about her life insurance policy. I’ve had conversations about life insurance plenty of times. Never once has anyone been that excited about the conversation that they raise their hand and thank God for their insurance policy. This is where mobile advertising gets it all wrong. What’s more, this ad was found in a solitaire game. Not to stereotype, but plenty of older folks love to play solitaire. What bothers me so about it (aside from the overall lack of design in the ad itself, sans content) is the content is outright offensive to me. The idea that someone’s grandma grabs their Samsung Galaxy Tab to play a game of solitaire for relaxation and is confronted with what amounts to “I’m going to die soon” is quite poor in my opinion. Surely whoever generates these ads could be more creative and not remind people about how there is a terminus to our lives. Furthermore, the app developer should do some quality assurance to make sure the content of their advertisements isn’t completely rubbish. Just like this. I would very much prefer to see an ad that has some style to it and content that targets people correctly without being quite so offensive. If you’re creative enough to come up with an app and code it, you should be creative enough to find an advertising method that syncs with your creativity. It should not be too difficult. Please, developers, please use better ads. Use companies that have solid ads to target your demographic that look nice and don’t remind people about dying. I think the user base as a whole would appreciate that.